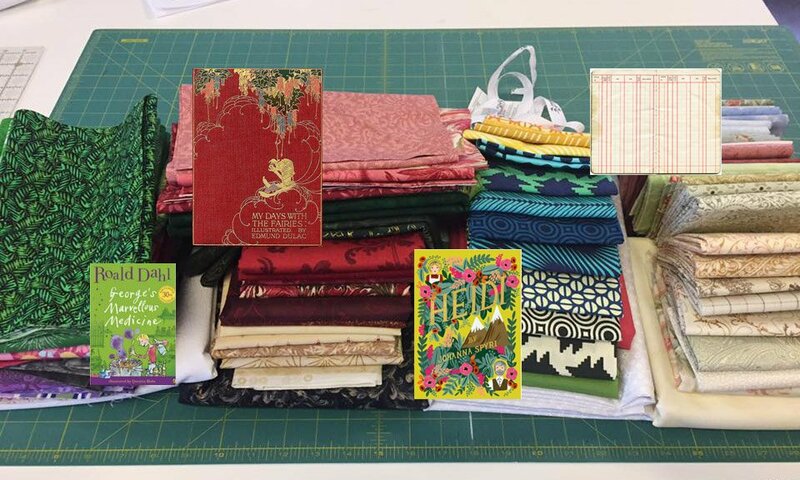 I've been enjoying looking at all the Children's Library blocks that are being posted on Pat Sloan's Facebook page - the variety is amazing. 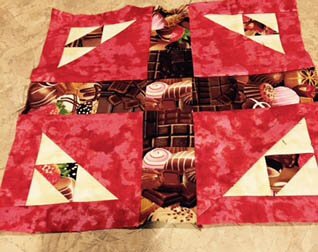 Suzy Lawhon Bishop caught my eye when she made 24 of them and is making a quilt top of just the Mother Goose blocks. Her red HSTs almost dance across the top forming a secondary lattice pattern. With her permission, I have added her pictures to the gallery. The gallery continues to grow and now there are January's "Mother Goose" blocks, February's "Curious George" blocks, and the start of March's "Poky Little Puppy" blocks to enjoy. Here at Fabric At Work, one of the "Quilt Celebrities" we admire is Pat Sloan - that lady does it all! (Victoria has an e-groupie story to tell if you ever meet Victoria at one of our classes or shows.) For the past few years Pat has offered a Mystery Block of the Month with a theme. 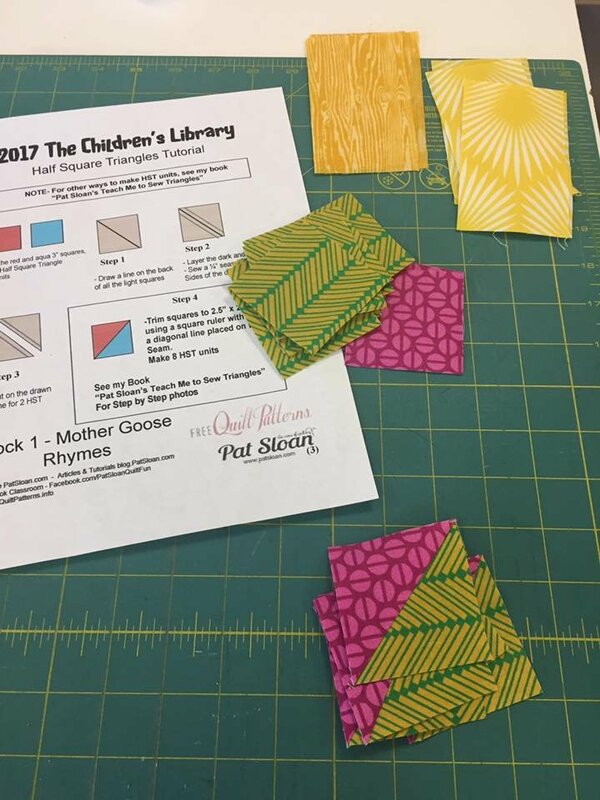 This year's theme is Children's Library - and while the 2017 blocks are not necessarily "books" the colors and layouts evoke a children's book theme. Since the F@W folk have very different styles and quilt expertise (and favorite books), we thought it would be fun to see how each of us approaches the year within these mystery blocks. We're being joined by a few friends and family, some of whom are beginning quilters. Stay tuned - and we will put highlights in our Monthly Newsletter. 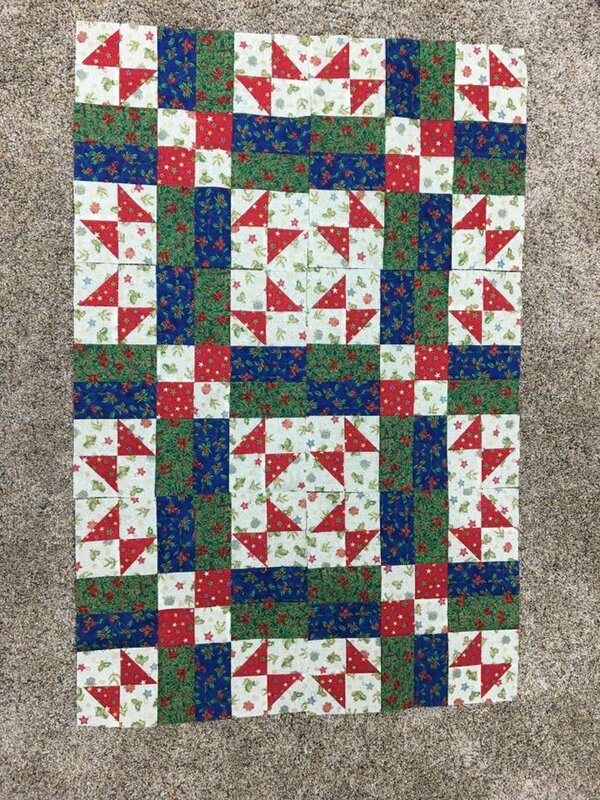 The pieces and units (HSTs and 4-patches) this month are essentially the same as for BOM 1 “Mother Goose” - so I do not need to do any new quilty math for resizing or construction engineering for more efficient piecing. This month’s challenge lies in the fact that I only used 3 fabrics and the background in each block for my BOM1 and this month’s block uses six fabrics (one could/will be the background). In each of the first Children's Library (Mother Goose) blocks I used one colour – or hue to use the technical term. Hue is what we think of as pure colour, or more generically call "brights." In the blocks, I have a white which is none-of the-colour (the background) and a medium, dark-medium and a very saturated colour - which is so dark it is almost looks black. To get variety in a hue, you can add white, black or grey. For my Mother Goose blocks I had kept to pretty much the same pure hue, but used a print that varied the amount of the hue. I would like to keep the same intensity in my hues, so I need to look at other ways to increase variety. 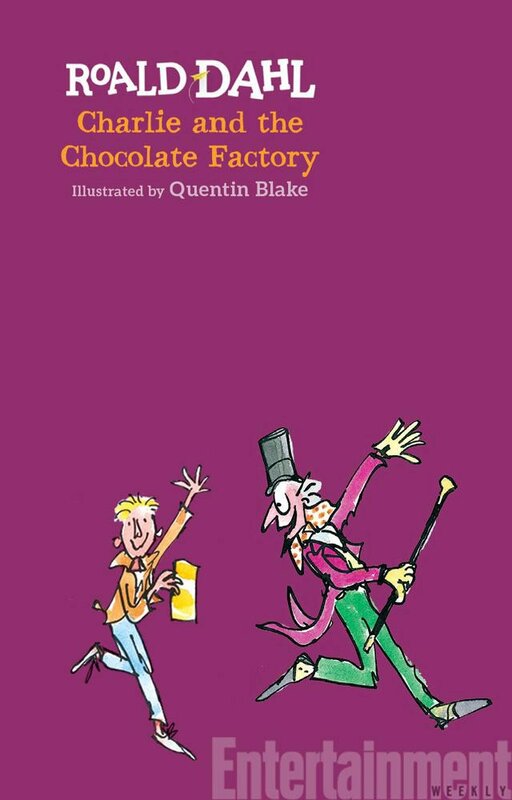 In the rows below the illustrations are all pure black on a white background. 1) Vary the proportion of colour to white. In this row - as the size of the black dots increases and covers the white background - the squares become darker, but the actual hue - black - did not change, i.e. there was no grey. 2) Vary the scale of the print. In this row – the dots and the background remain in the same proportions, but as the scale of the whole pattern gets smaller - the squares look darker, but the actual hue and proportion of the hue, did not change. 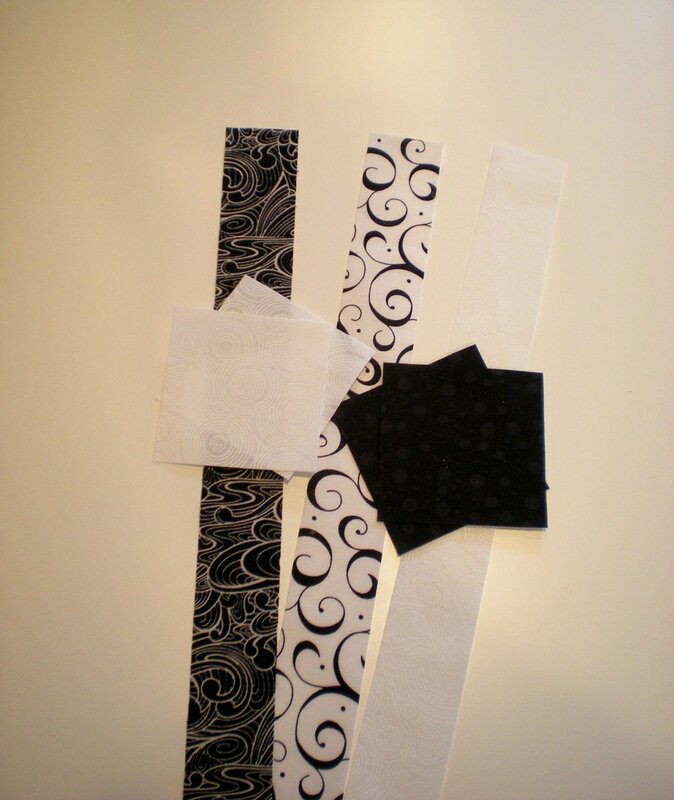 2) Vary the pattern of the fabric. Finally, and this is probably the best part of working with fabrics, pattern allows for variety. 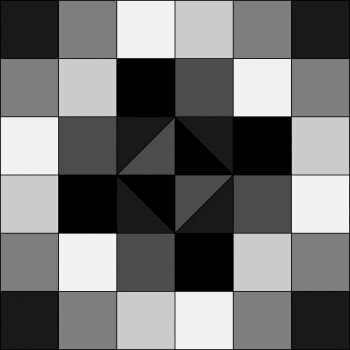 In the squares below there is only black and white, and the proportion of black to white is similar, but because the pattern varies, there is contrast. 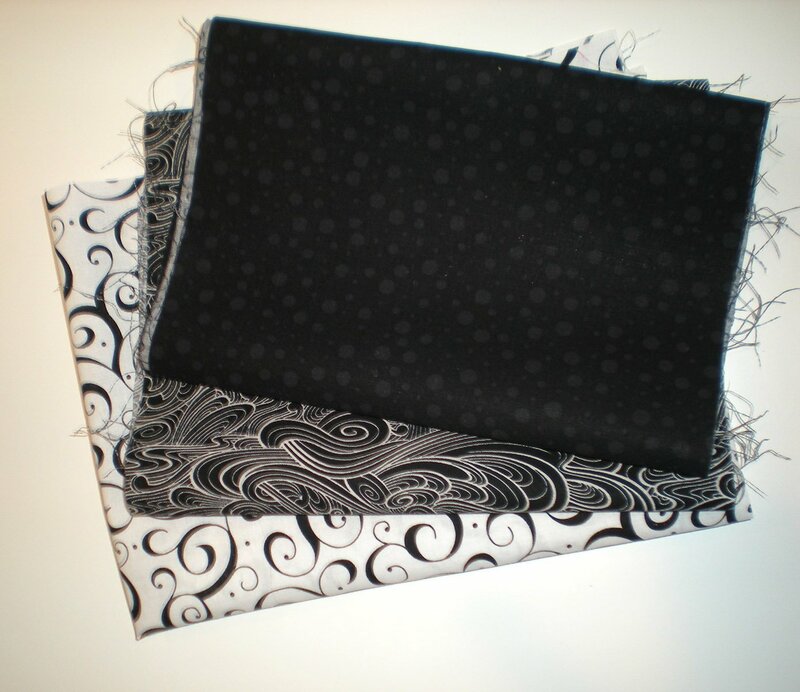 I can choose fabrics with more black - what we think of as “darks” - however I already have pretty dark hues in each block. I can choose fabrics with more white - what we think of as pastels. 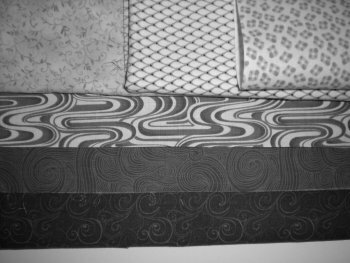 Seeing them in black and white - I like the slightly more crisp pattern of the fabric on the top left. The process (as with any quilt project) starts with fabric selection. Since we all professed an intention to continue to stretch our creative wings and expand our skill boundaries in 2017 (sounds like an awesome goal, eh? 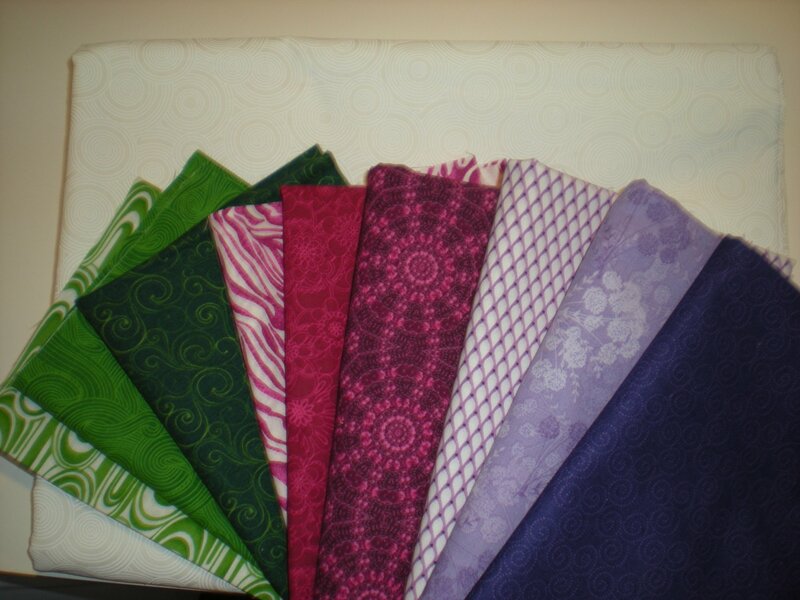 ), we put Kristy in charge of selecting our "scrappy" fabrics for us. We were able to make a very rudimentary preference request but Kristy had to take it from there. 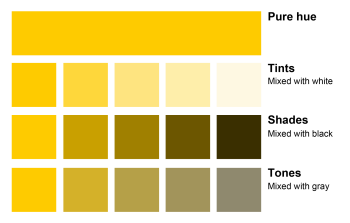 Victoria - a color palette to match the new Fabric At Work logo (so she can play with the colors while not on a computer). Joy - something that says spring (winters are pretty long here in Wyoming). Kathryn - classy reds and golds, with a surprise color (wait until you see what Kristy decided to throw at her). Kristy - something she normally would never use (and she already has a wide range of styles). Kristy headed to the "treasure trove" that is her shop. Once there, she videoed herself "in action" in order to give us an opportunity to watch the process she uses when selecting fabrics for, or with, her customers. The final result is in the gallery below. A lot of folk have had "ooops" moments when assembling the Mother Goose block. 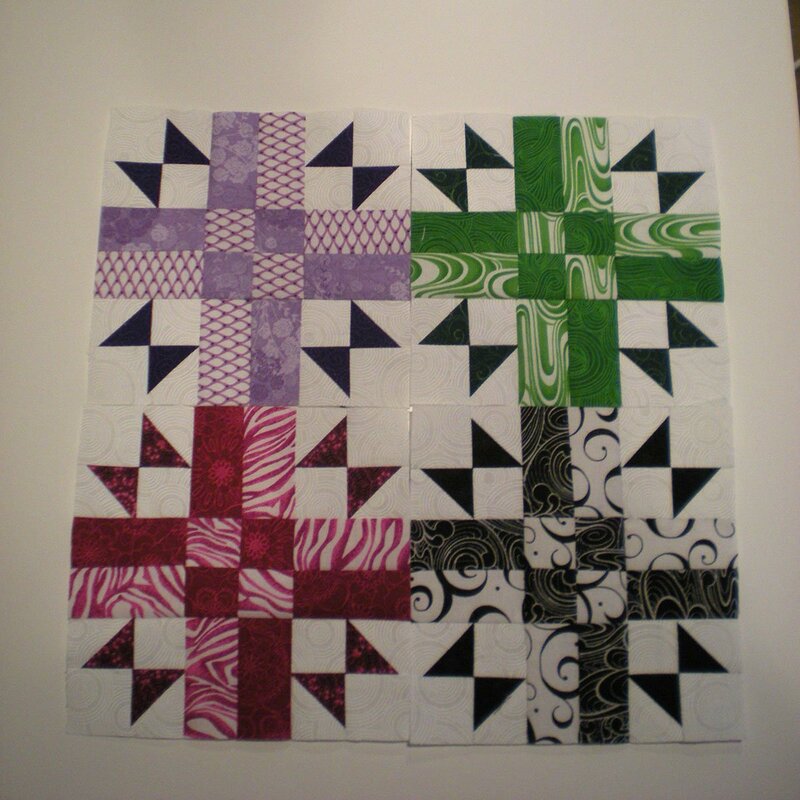 This is pretty easy to do - the block is an asymmetrical, abstract pattern (i.e. the sides don't mirror and it does not make a recognizable "picture," like say, a house). When you flip patches or units (deliberately or accidentally) you can end up with some pretty neat variations - which may be what you want (creativity!) or not (ooops!). Kristy posted another video about her "ooops." I don’t often follow a pattern step-by-step. Most often this is because I want to change something specific (size, placement of pieces, etc. ), but sometimes it is for the fun of testing my skills to see what else I can turn a block or pattern into (someone has already figured out one way, is there another?). 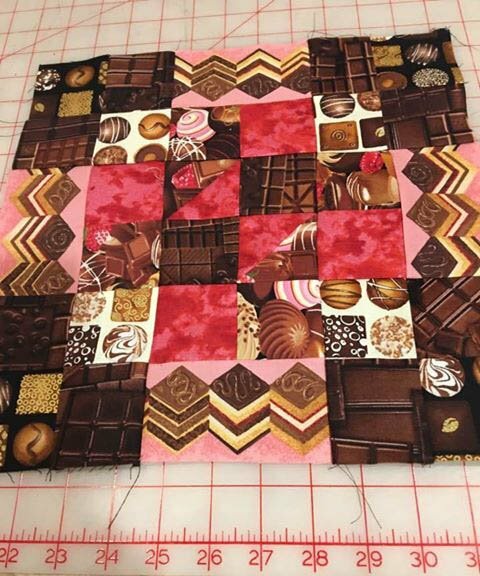 The end piece is sometimes better - sometimes not - but for me the most rewarding and enriching part of quilting is creative problem solving (I do this with cooking also - usually with less success). When I look at a quilt or a block, I like to mentally deconstruct it to get a sense of the components and how they work together. Then I like to test my creativity genes and come up with a different way and/or more efficient (to me) way to construct those components. Pieced patchwork often fits into an overall grid such as 2x2 (e.g. 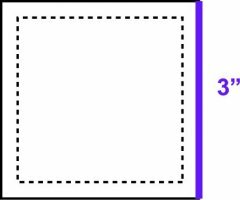 blocks with four patches in them), or 3x3 (e.g. 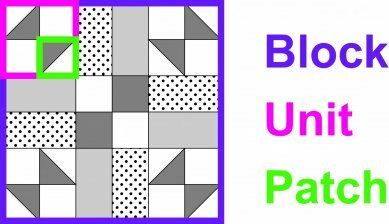 blocks with nine patches in them) etc. which can provide many options for easily making changes. Of course there are infinite variations of these, and paper piecing and art quilting take everything to a whole new level. 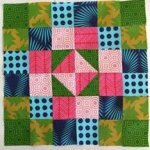 Throughout F@W’s Pat Sloan BOM series, I will be talking about methods for changing the block for that month through my quilt “adaptation processes.” If you like to just follow a pattern “as-is” you can simply skim these posts and remain happy with the fact that someone else writes patterns and publishes them. If you’re someone who wants to dabble in making something of your own - I hope my sharing during the BOM will be helpful. In this section I’m going to talk about scaling down (but the same principles apply to scaling up). Here’s quick introduction to the terms I’ll be using. 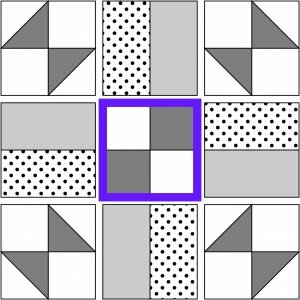 Patches are essentially the smallest “regular/repeated” elements in a block. Several patches make a unit. The units are then assembled into a block. 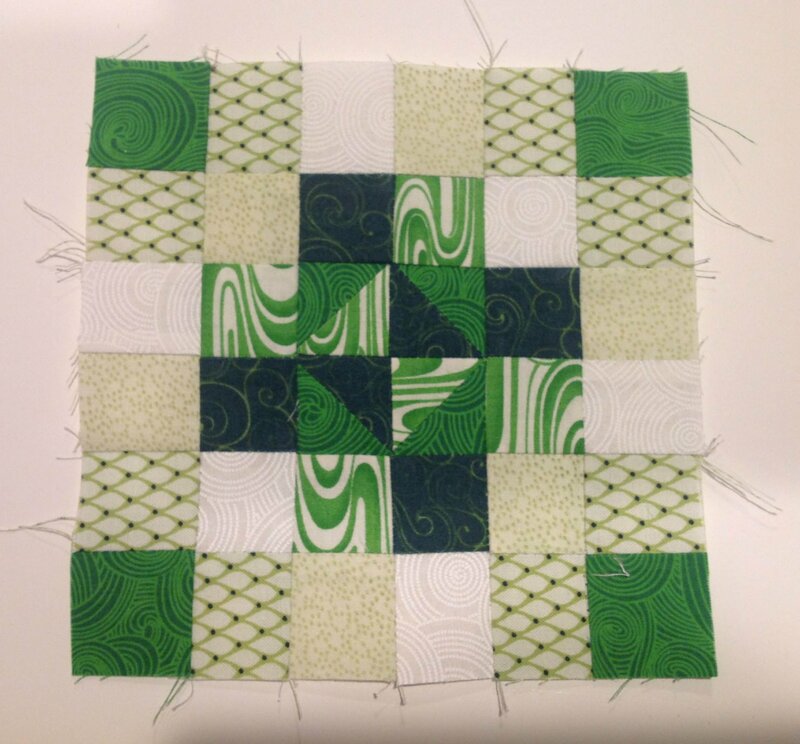 When I refer to an unfinished block, unit, or patch - that’s the size it is when it’s “all by itself.” When referring to finished sizes - that’s when it has been sewn to all its neighbors (and its edges are “lost” in the seams on all four sides). 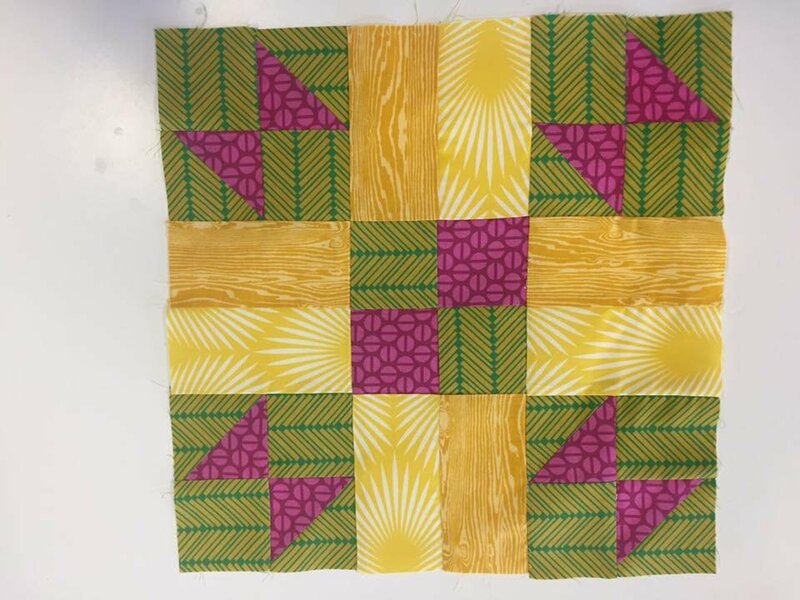 Many bed/throw quilts are based on a 12” finished block - the pieces are large enough that they go together pretty quickly, you don’t need that many 12” blocks for a quilt, and 12” is nicely divisible by 2, 3, 4, and 6. 1) I don’t have that many beds (and I like duvets anyway). 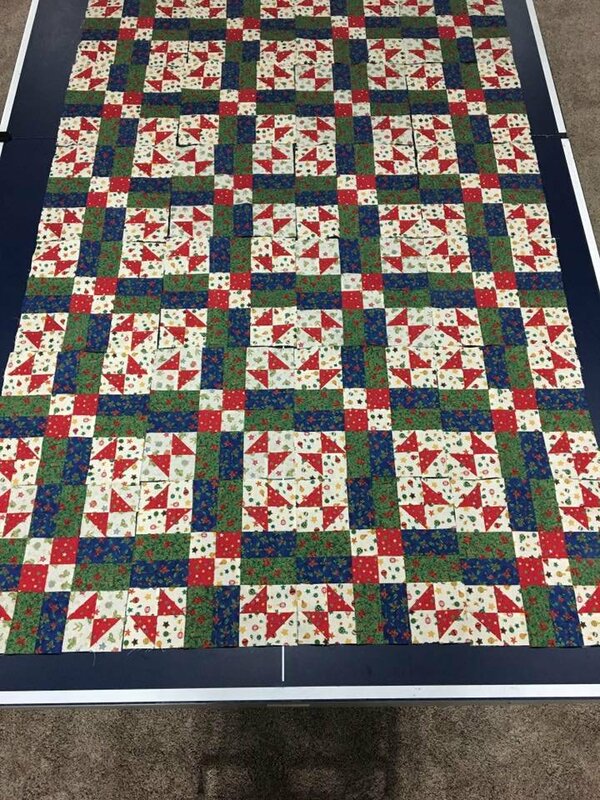 2) I don’t like it when quilt projects get so large I'm having to wrestle with them. 3) Often I really only want to make a few blocks - to see how they work/look/play with colors - and a few small blocks seem more playful. 4) I have quite a bad case of iPADS - insufficient project attention/determination syndrome - if a project takes too long it becomes a WIMP (work in macroscopic progress). 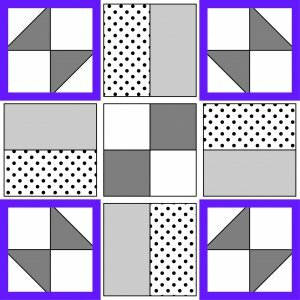 So if I see something I like, but need to scale it down, I have to whip out my quilt math. Here’s where I want to thank every math teacher I ever had. I think I was a good student (my parents would have not permitted anything else), but teaching math is hard and apparently my teachers succeeded - I’m not someone who helplessly says “I don’t understand math” - I'm more the person who says "I can figure this out." The Children’s Library Blocks are 12” when finished (too big for me), so my first task is figuring out my desired scaled down size. 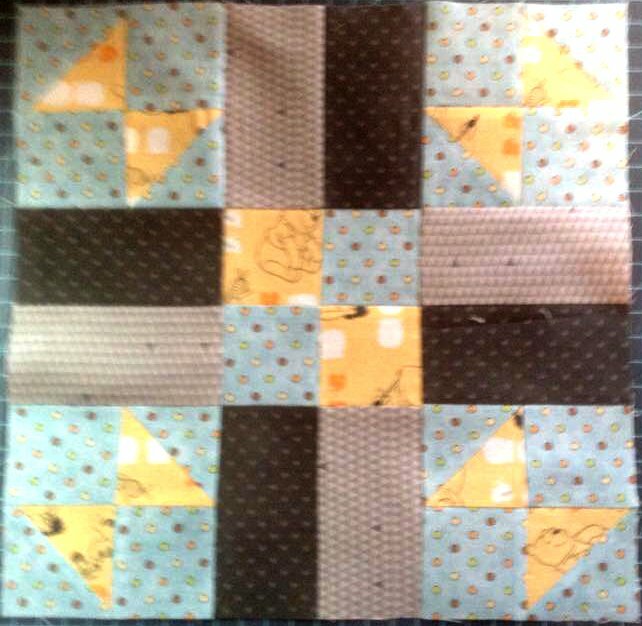 Here’s the Mother Goose block and it is based on a 3x3 grid. 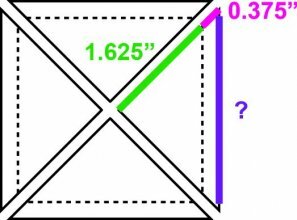 So - for ease of math - I’m going to want my new block size also easily divisible by 3 (so, 9” or 6”). So - again for ease of math - I’m going to want my new finished unit size also easily divisible by 2. First-note-to-construction-self: both of these cuts are easily manageable, however there are pre-cut “skinny strips” or “honey buns” which are 1.5” wide - so I’ve decided a 6” block will be a good option. Second-note-to-construction-self: this is a mystery BOM - the next block may not be easily divisible by 6 - this could be interesting. In this section I am going to discuss the use of strip piecing to make multiples of units. Sewing longer pieces is more efficient and lessens those pesky potential error points - less lining up of little pieces (alignment errors), less seam beginning and ending points (which is where most seams can drift – Kate Colleran calls this “taking a bad swing”), better results when pressing seams (fewer cut ends with stitches able to pop open). So where can I use strip piecing in this block? Looking at the whole block I have several areas that are multiples of the same unit and the side units lend themselves to strip piecing. I have decided to re-size the Mother Goose block to a 6” finished block, and that means my finished units will be 2” finished (2.5” before finishing). Each strip needs to be 1” wide finished - so they’ll be cut at 1.5” (back to those honey buns or skinny strips if you have them). There needs to be at least 2.5” length for each unit (the size of the unfinished unit) and four will be needed for each block: 4 x 2.5” = 10”. 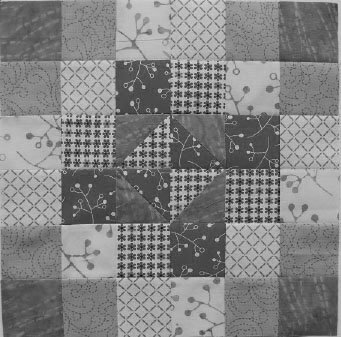 So the block will need one strip that is 1.5” by at least 10” of both the light grey (or whatever fabric you have chosen to put here) and the dots (again, whatever fabric you have chosen to put here). I'll cut the strips slightly longer (~10.25”) so that I can trim off the ends of the sewn strip sets slightly (if needed) to make them even and square. Sew the strips together and press with the seam toward the dots. Sub-cut the sewn strip set into four 2.5” lengths. 1) If the difference is along the length of seam line - you will need to check your cutting technique and the rulers you are using. 2) If the difference is across the strips - you will need to check your seam allowance. 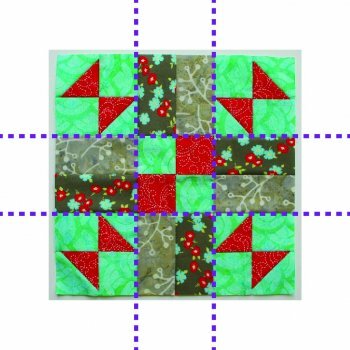 There are several tutorials on this, including a post by Pat Sloan herself, and Kathryn will be demonstrating tools and notions to help seam accuracy later in the year (sign up for updates here). 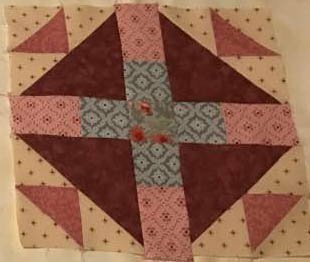 3) If the difference is in both directions, do 1) and 2) - sorry, but it really is better to figure this out at the unit, rather than the quilt stage. 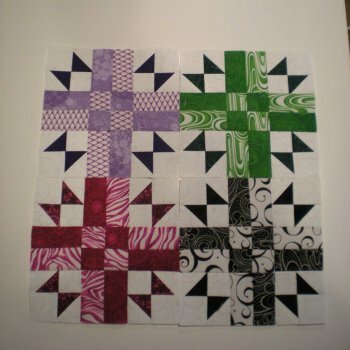 For this block there is only one four patch unit, but the strip piecing method used above still captures the same lessened-error-point benefits. This unit too, will finish at 2” x 2” and will be 2.5” x 2.5” unfinished. I’ll need each strip for this unit to be 1” wide finished - so they’ll again be cut at 1.5” wide, and I’ll need at least 3” length for each unit (the size of two 1.5” unfinished patches). So the block will need one small strip that is 1.5” by at least 3” of both the medium grey (your chosen fabric for this area) and the white (your chosen fabric for this area). Again, I’ll cut slightly longer in length (~3.25”) so that I can trim off the ends of the sewn strip sets slightly (if needed) to make them even and square. Sew the strips together and press with the seam toward the darker fabric. Sub-cut the sewn strip set into two 1.5” wide sections. Flip one of the pieces and sew together. The two seams should nest. Press the center seam open. Again, your unit should measure 2.5” x 2.5” – if not use the troubleshooting tips above. In this section I’ll tackle those little half-square triangles (HSTs) and here’s where some trigonometry becomes helpful. 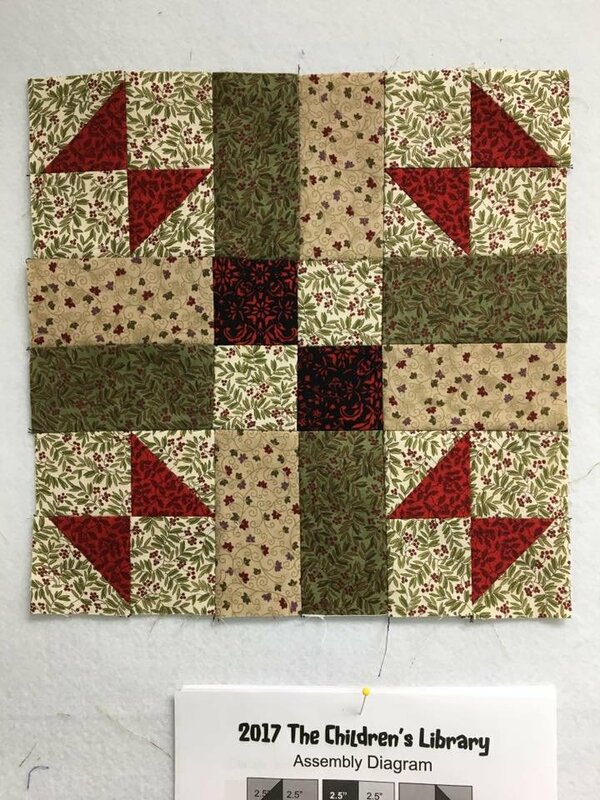 There are several methods for HSTs – if you have been quilting for any length of time you probably already have a favorite method (if not Pat Sloan’s “Teach Me to Sew Triangles” book has step-by-step photographs or you can google video tutorials). Personally, I have two “go to” methods. However - whichever method I use - I am always using starch. I starch all my quilting fabrics (it has changed my quilting life), but it becomes more essential with HSTs because of those bias edges. 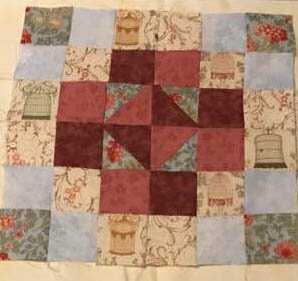 Place two squares the size of your unfinished patch right sides together, sew from corner to corner, trim seam to 1/4” on one side, press seams open (this reduces bulk, which is particularly important when making smaller blocks). 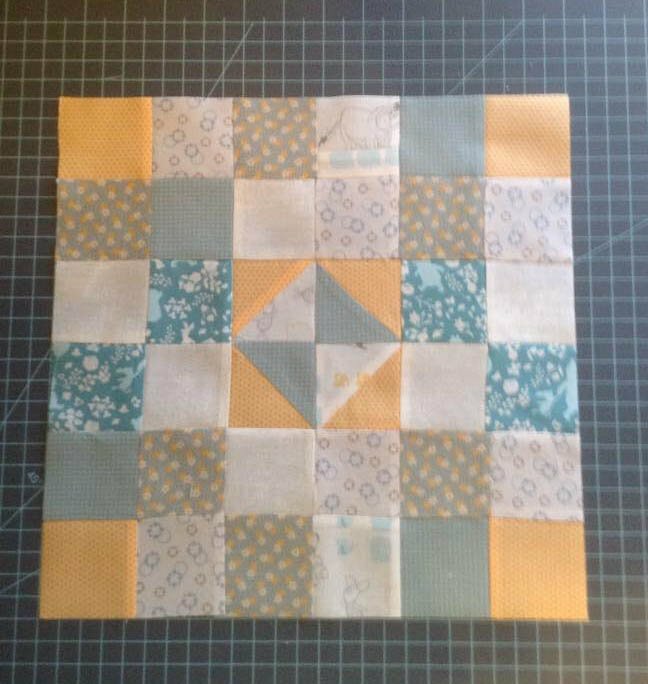 For the Mother Goose block I would repeat this eight times to get the needed eight 1.5” x 1.5” HST patches. 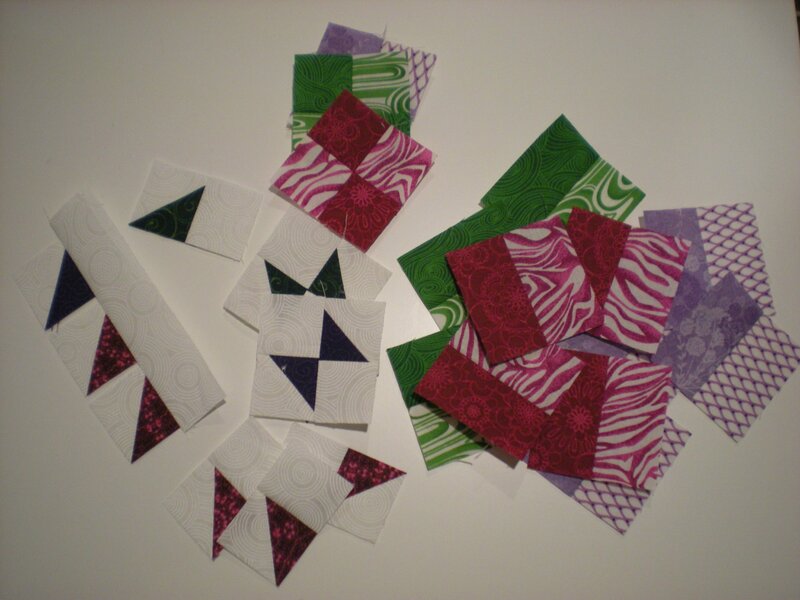 Yes, this method “wastes” the smaller trimmed triangles, but since I make small blocks, these pieces are usually tiny. Why do I like this method? For me, sewing point to point is easy, without having to draw lines or sew alongside a line, or having to carefully cut between two seams, and I consistently get an accurate result. 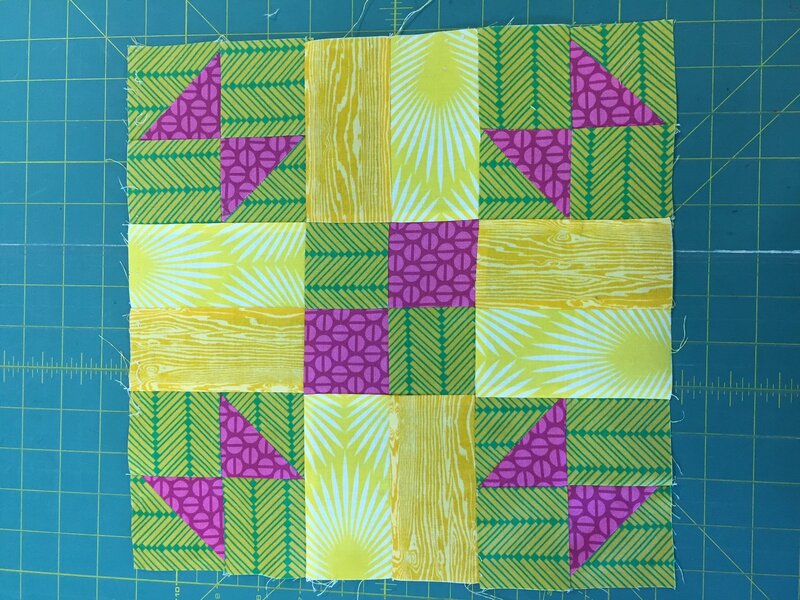 Secondly, if I am dealing with directional fabrics, this method allows me to orient the direction correctly by placing the squares where I need them for each and every HST. 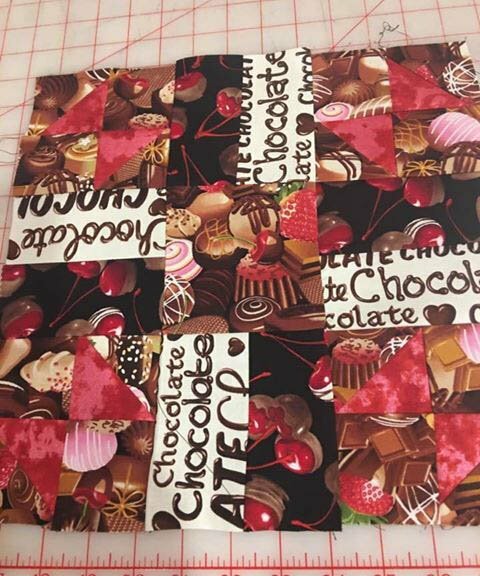 If I need to make several HSTs in the same fabric pairs this is my usual method. 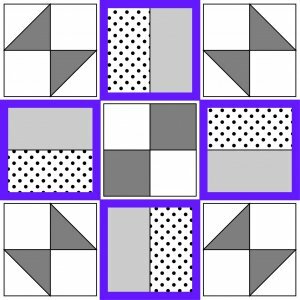 Place two squares (size calculations explained below) right sides together, sew around all four edges, cut the square from corner to corner for both diagonals, press all seams open, square up and trim to size. The advantage to this method is that you get four HSTs at once (there are methods to get eight HSTs or more from two squares). A disadvantage is there are bias edges on the outside edges - so only use when the units are small, use them in units sewn to other units (rather than around block edges) and always use starch (as I do with all fabric). So how do I know what size to make those initial squares? 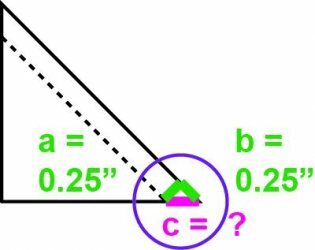 I ask Pythagoras. 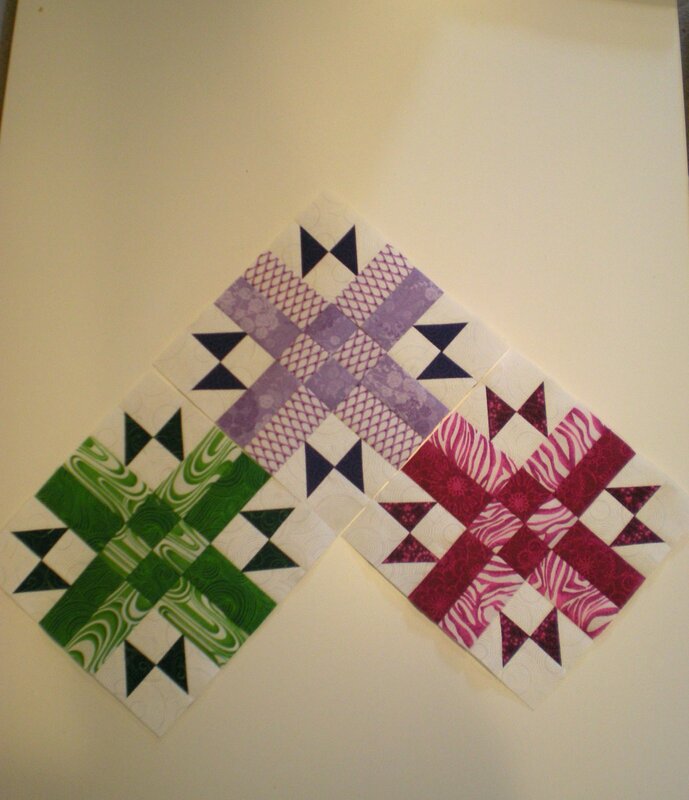 In my 6” finished Mother Goose block example I know that I want the HSTs to be 1” finished and therefore 1.5” unfinished. So the portion of the diagonal that later becomes the unfinished HST patch side - must be greater than 1.5” to allow for some trimming and squaring (so I’ll use 1.625”) and must include 0.375” for seam allowance. For the Mother Goose block I will repeat this four-HST method twice - using a total of four 3” initial squares - to get eight 1.5” x 1.5” HST patches. 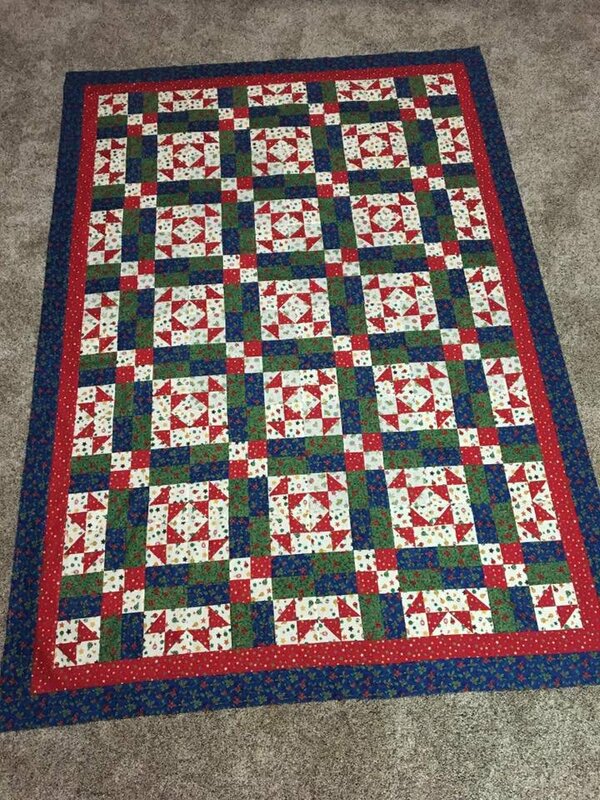 By Request: Here's another example for a common HST size – 2” finished (2.5” unfinished). The diagonal section length must be greater than 2.5” to allow for that trimming and squaring (use 2.625”) and must include 0.375” for seam allowance. Since quiltmaking uses ¼” (0.25”) seams, where does the 3/8” (0.375”) needed for the seam allowance come from? Again it is Pythagoras. The seam point is another right-angled triangle. 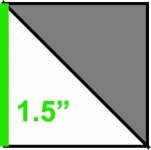 Note: this 0.375” measurement does not change for different size triangles because in quilting the seam allowance is always 1/4” so you always include 0.375” to allow for the point of a HST. 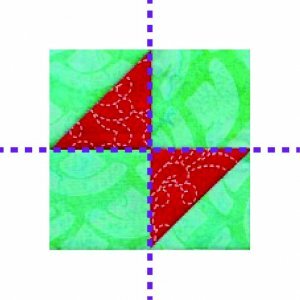 My last section for the Mother Goose block is about another sewing efficiency - patch (or unit) to strip piecing. 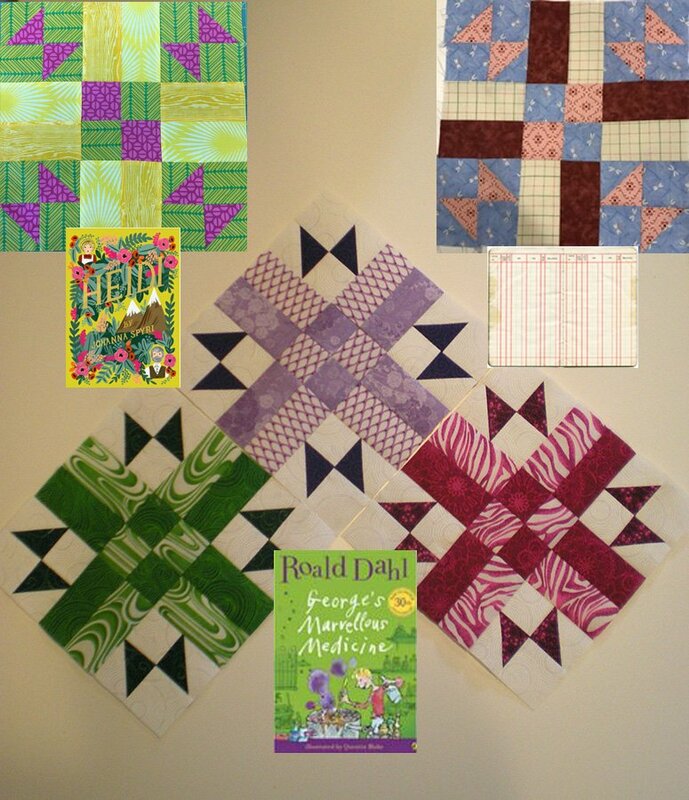 For the Mother Goose block there needs to be four HST four-patches. 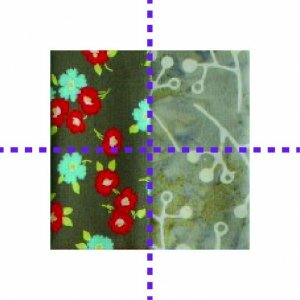 You could now cut eight 1.5” squares and sew each square to the eight HST patches created above, but this means aligning eight pairs of tiny patches and having sixteen error-prone seam beginnings and endings. 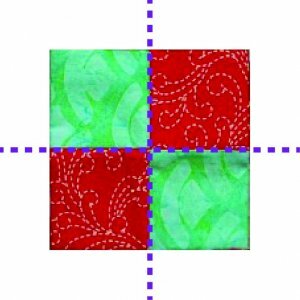 To reduce this, the eight HST patches can be sewn to a single strip of 1.5” wide fabric. I like to leave a little gap (~1/8”) between each unit to allow for accurate trimming of units, so my strip needs to accommodate eight 1.625” (1.5” + 0.125”) spaces. Note: make sure your HSTs are facing the same direction. Align each HST patch with the edge of strip, leaving a small (~1/8”) gap and sew. Press with the seams toward the strip and cut the strip to make 1.5” wide units (aligned with the edges of the HST patches). 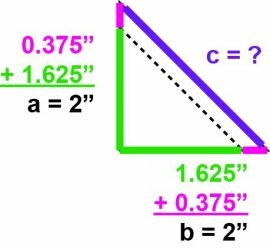 Note: there should be 1/4” between the points of the triangles and the edges of the units. Put the units into pairs, flip one unit, nest the unit seams, and sew. Press the center seams open. Note: all triangle points should be 1/4” from the edges of the units. Again, your unit should measure 2.5” x 2.5” - if not, use the troubleshooting tips above. 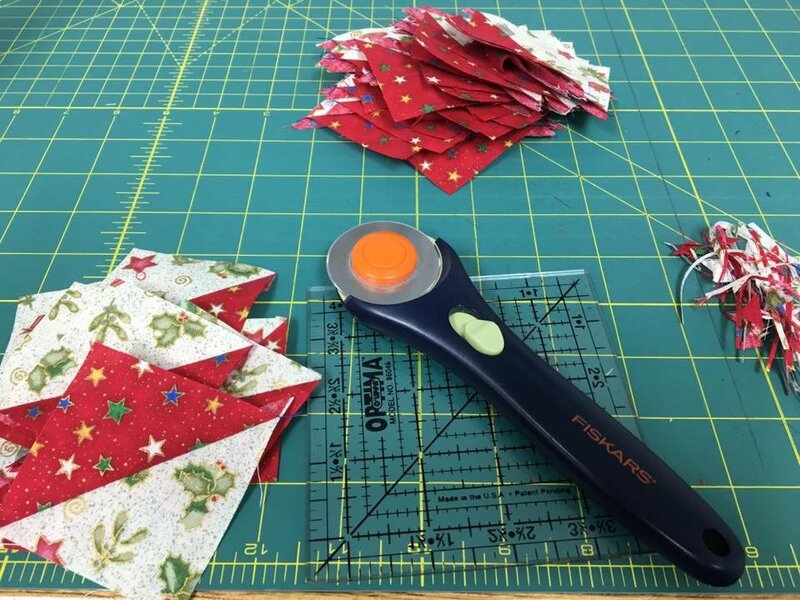 If your unit is too large – do not simply trim down - you will lose the 1/4” between the points and the edges and end up with “chopped off” points when you sew these units to the neighboring pieces. Backtrack through the steps and make sure of your measurements for each of the components, and double check your seam allowance. Accurate quilt piecing comes down to a few things: good fabric (I also pre-soak in starch), accurate cutting (know your rulers, notions, and techniques), accurate sewing (really, really, master the 1/4” seam), and correct pressing (not ironing). In the upcoming year, all of us at Fabric at Work intend to write some detailed pieces on each of these things, keep checking back, or sign up for updates. 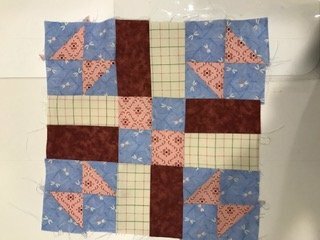 Final, final, thought: never under-estimate the benefit of a good "basics" class and/or the support and guidance of a quilting friend.